Photojournalism is a form of journalism that employs images in order to tell a news story. It is now usually understood to refer only to still images, but in some cases the term also refers to video used in broadcast journalism. Photojournalism is distinguished from other close branches of photography (e.g., documentary photography, social documentary photography, street photography or celebrity photography) by complying with a rigid ethical framework which demands that the work be both honest and impartial whilst telling the story in strictly journalistic terms (reference: Wikipedia). Documentary photography usually refers to photography used to chronicle events or environments both significant and relevant to history and historical events as well as everyday life (reference: Wikipedia). The origins of photojournalism are in war photography. During the Crimean War, a British photographer, Roger Fenton (1819-69), was the first official war photographer. His work included documenting the effects of the war on the troops, panoramas of the landscapes where the battles took place (e.g. the cannonballs), model representations of the action and portraits of commanders (reference: Wikipedia). The images were taking using a plate camera (requiring a long shutter speed) and tripod, and some are quite contrived because people (and animals) had to stand still for so long. Originally, individual photographs were used in newspapers to enhance text but later, in photojournalism, series of photos were used as the main way to give information, supplemented with a smaller amount of text. Jacob Riis (1849-1914), a Danish photographer who moved to New York, worked in this way. He experienced poverty and became a police reporter writing about the quality of life in the slums of Manhattan. He attempted to alleviate the bad living conditions of poor people by exposing their living conditions to the middle and upper classes in his work, How the Other Half Lives. Development of the compact commercial 35mm camera and the first flash bulbs in the late 1920s allowed the journalist more flexibility in taking pictures. Subsequently, the 1930s to 1050s is considered the ‘golden age’ of photojournalism when magazines used photography to tell stories (photo essays). Henri Cartier-Bresson (1908-2004) is held by some to be the father of modern photojournalism. He was a French humanist photographer considered a master of candid photography, and an early user of 35 mm film. He pioneered the genre of street photography, and viewed photography as capturing a ‘decisive moment’. W. Eugene Smith (1918-78) was an American photojournalist, who has been described as ‘perhaps the single most important American photographer in the development of the editorial photo essay.’ His 1948 series, Country Doctor, photographed for Life magazine is now recognised as ‘the first extended editorial photo story’. David Hurn (1934-) is a Welsh documentary photographer and member of Magnum Photos. However, in a talk with Bill Jay, he said that photojournalism has bad connotations, and he turned away from documentary photojournalism, bringing a more personal approach to his image making. Photojournalism works within the same ethical approaches to objectivity that are applied by other journalists. What to shoot, how to frame and how to edit are constant considerations. Photojournalists have a moral responsibility to decide what pictures to take, what picture to stage, and what pictures to show the public. Photographs of the dead or injured can arouse controversy because, more often than not, the name of person depicted in the photograph is not given in the caption. The family of the person is often not informed of the photograph until they see it published. A photograph by Eddie Adams (1933-2004) of the street execution of a suspected Viet Cong soldier during the Vietnam War provoked a lot of interest because it captured the exact moment of death. Being exposed to such violence can have physiological and psychological effects on those who document it and is but one of many different forms of emotional labor that photojournalists report experiencing (reference: Wikipedia). Kevin Carter (1960-1994) was a South African photojournalist and member of the Bang-Bang Club, a group of 4 conflict photographers who worked in the townships of South Africa between 1990 and 1994, during the transition from the apartheid system to democracy. He shot an image of what appeared to be a little girl, fallen to the ground from hunger, while a vulture lurked on the ground nearby. When the image was published, hundreds of people contacted the New York Times to ask the fate of the girl. The paper said that according to Carter, ‘she recovered enough to resume her trek after the vulture was chased away’ but that it was unknown whether she reached the UN food centre. The ethics around taking the photograph and whether photojournalists should be able to intervene in situation like this have been debated. 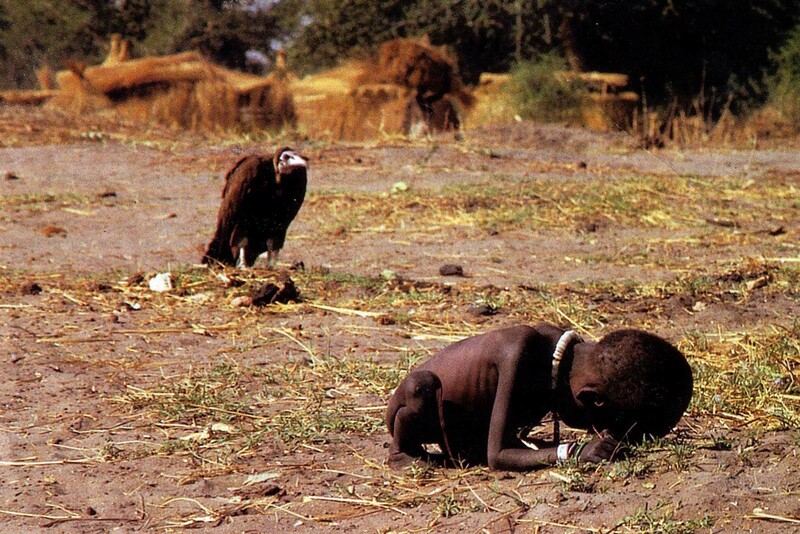 Kevin Carter committed suicide in 1994, the same year as he received a prize for this photograph, because he was haunted by what he had seen and photographed. Following controversies such as this, photographers increasingly started questioning themselves. Donald McCullin (1935-) is a British photojournalist, recognised for his war photography and images of urban strife, is quoted as saying ‘I have been manipulated, and I have in turn manipulated others, by recording their response to suffering and misery. So there is guilt in every direction: guilt because I don’t practise religion, guilt because I was able to walk away, while this man was dying of starvation or being murdered by another man with a gun. And I am tired of guilt, tired of saying to myself: “I didn’t kill that man on that photograph, I didn’t starve that child.” That’s why I want to photograph landscapes and flowers. I am sentencing myself to peace.’ He also said ‘Digital photography can be a totally lying experience – you can move what you want, the whole thing can’t be trusted really’. Photographers and the media are also having to find new ways to tell stories and get messages across because people are now becoming desensitised to these images of war, famine etc, which used to be shocking, because they’re now so common, appearing in our papers and on our screens daily. Luc Delahaye (1962-) is a French photographer known for his large-scale color works depicting conflicts, world events or social issues. He produces huge images using a plate camera so they aren’t like normal press images. His images have crossed into the art market. They have been displayed in museums and galleries, and some have sold for thousands of pounds, which raises ethical considerations. Paul Seawright (1965-) is a Northern Irish photographer who took pictures of the Orange Order. He would have had to build trust with his subjects and he doesn’t show their faces because of the high risk to their lives. The images don’t tell a narrative story. They are more abstract, and a bit sinister. This is a different strategy for reporting a story. Some of his images are reminiscent of Roger Fenton; for example, work depicting minefields in Afghanistan. Simon Norfolk is a landscape photographer who has photographed war-zones and refugee crises using a large format camera. 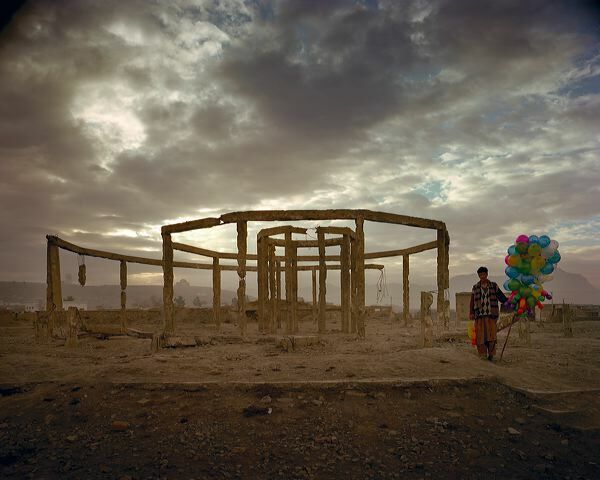 He uses beauty in his images to draw people in to want to know more about them: for example, beautiful skies carrying a risk of drones, and a man carrying colourful balloons past the remains of a bombed circular tearoom. Anastasia Taylor-Lind (1981-) is an English photojournalist who has worked on issues relating to women, population and war (http://www.anastasiataylorlind.com). Her work includes Portraits from the Black Square, which documents the 2014 Ukrainian uprising in Kiev. Originally she used traditional photo essays to tell a story with a beginning, middle and end but, more recently she has used other types of media such as video and sounds, so that her projects are more interactive and perhaps more powerful because of the context which aids understanding of the message. Although photojournalists are finding new ways to work, perhaps the most accurate or factual form of photojournalism used today is the images captured by camera phone by citizens watching an event unfold. Despite the lower quality of the images, the media is increasingly using images produce in this way.